Home » Coin Sets » What was the Deal with the Trade Dollar? 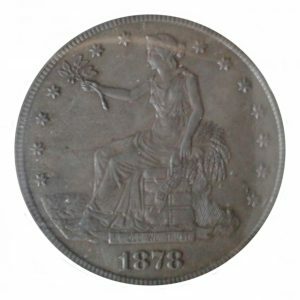 In a time that the United States was going through a major depression, known as the Panic of 1873, a new Silver Dollar was being designed by Chief Engraver William Barber in hopes of trading with the Far East. The United States was going through a Reconstruction period after the Civil War. By 1873, North America and Europe would go through a Great Depression, similar to the one in 1929. With the hoarding of silver during these tough times, the US government decided to go from a bimetallic standard of silver and gold to just a gold standard. This would stop production of some silver coins including Half Dimes, the Three Cent Silver, and the Seated Liberty Dollar. With these coins being eliminated from the Coinage Act of 1873, a new coin would be added, known as the Trade Dollar . The Trade Dollar was created in an effort to improve the United States’ relations with China and the Far East. With some of eastern Asia controlled by European counties including the United Kingdom, France and Spain, the United States wanted to trade with them while going through tough times and to compete with the Mexican Peso. The Trade Dollar was being minted in Philadelphia, Carson City and San Francisco. Being on the Pacific coast, San Francisco would mint more than the other mints. To compete with the Mexican Peso, the Trade Dollar would weigh 420 grains or 27.2 grams, which would be 8 grains bigger than the typical US silver dollar. Though it would be 4 grains heavier than the Mexican Peso, the peso would have slightly more silver at 90.3% vs. the 90% Trade Dollar. Chinese businessmen added chop marks to the Trade Dollars to verify their correct weight and value. Most of the Trade Dollars would be sent across the sea in 1873, but by 1874, some of them would make it in American’s hands. By 1876, Congress was considering making the Trade Dollar worth five dollars, but instead demonetized them. The act didn’t affect the Trade Dollar much as mintage reached a high in 1877 with over 9.5 million dollars being produced. Reviewing how the Trade Dollar was doing in China, it wasn’t as successful in the northern portion as it was in the south. It also wasn’t popular at US banks and businesses and would stop being produced for circulation in 1878. Proof Trade Dollars would continue until 1885. 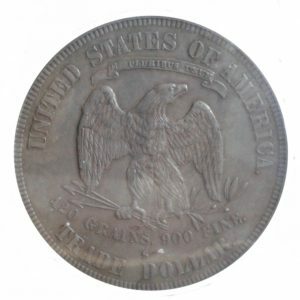 With the high mintages in San Francisco, you can get a circulated Trade Dollar between 1873-S and 1878-S for $300 or less. Even the 1873, 1874, 1876, 1877 and 1878 circulated dollars from Philadelphia can also be acquired for $300 or less. Uncirculated Trade Dollars start at around $1,000. Be careful when purchasing Trade Dollars as many counterfeits have come out of China. One of the most common fakes is dollars without silver. Check it with a magnet. Silver coins will not attract to a magnet. Also some of the Trade Dollars don’t have as good of detail as the authentic ones. Make sure you purchase from a reliable dealer. The short lived Trade Dollar is not as highly collected as the future Silver Dollars , Morgan and Peace Dollars, but makes a great addition to a Type Set, like I have been building. Would you consider purchasing a Trade Dollar? As a lover of history, I really enjoyed reading your post! Being from Kentucky, we were neutral during the Civil War but it was still a hot topic growing up there in the 1970’s. 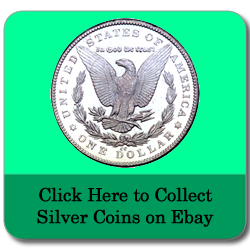 Your knowledge and love of rare, collectable coins is evident here, but it also seems you are equally knowledgeable about history. I never tire of reading interesting posts about history so I will add my name to your email list. Thanks for the comment Billie! I always enjoyed US History and learning about how coins were involved in history. My cousin and I visited Gettysburg a few years ago. So, I got more interested in the Civil War, especially since my ancestors didn’t arrive in America until the 1880’s. I hope you do subscribe and enjoy my posts! always has been apacionate and interesting to know the history of how to market the products in the United States and the appearance of the silver coins. I consider this to market products in the United States greatly influenced the economic development of our country, therefore very important to collect these coins because they are part of history. Hi Renan. Yes, coins have been an important part of US History. I’ve been learning more about that since I’ve worked on this blog. I also love history. I am not an USA citizen but found your post very interesting and informative. The detail is very impressive and today I have learned one more thing. Trade Dollars and the value they carry. I have never realized that! Thank you very much for enriching my knowledge with this great post. Hey Rika! I’m glad you enjoyed the post. Trade Dollars weren’t popular back in the day, but are popular today among collectors.